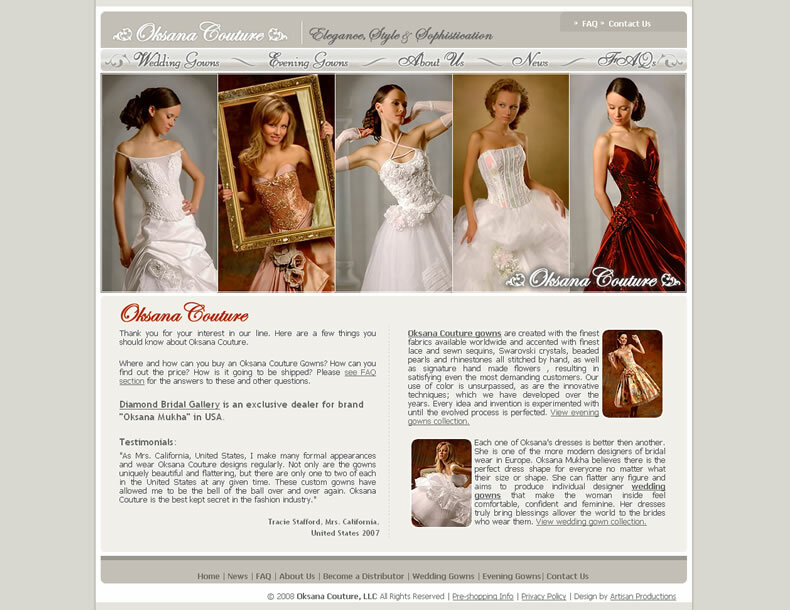 Task:Create an ellegant, high-impact website for a bridal salon. Incorporate provided photographs and content into CMS-driven web application. Create a news blog. Entice visiting brides with a high-end designers dresses, gorgeous evening gowns and absolutely stunning wedding gowns. SOLUTION: Artisan Productions created a beautiful CMS-driven website with lots of interactive content. 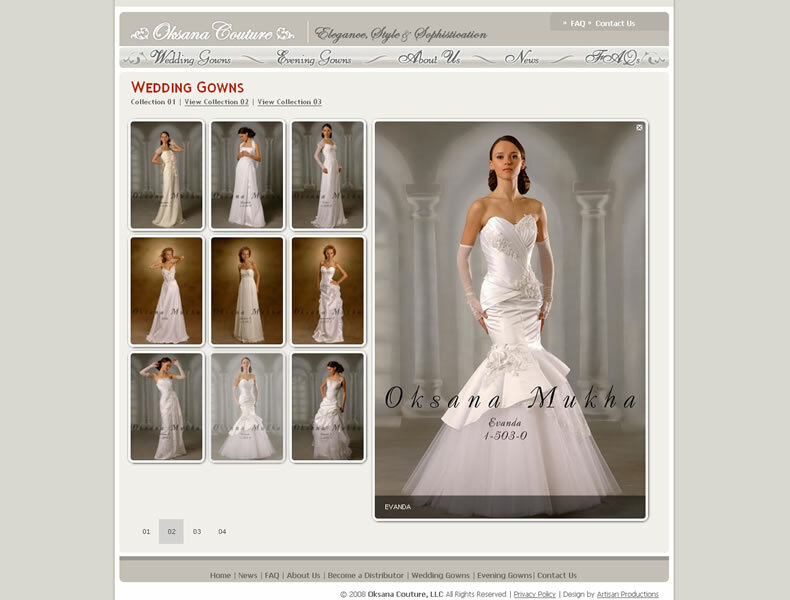 OksanaCouture.com got it all - dynamic flash galleries, news-blogg, latest press releases and other widgets. 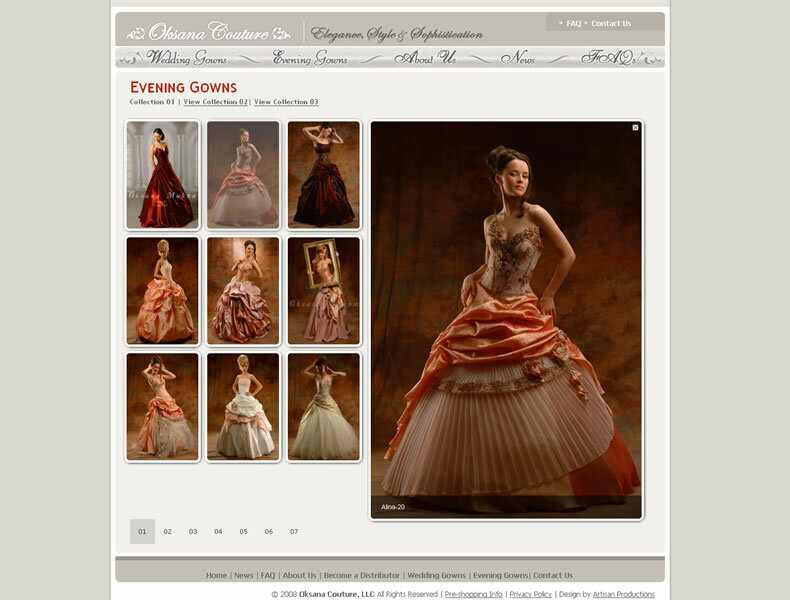 As a result, we delivered an ultimate browsing experience for the brides and other visitors. "We selected Artisan Production because of their reputation for clean, smooth layouts and attention to details. Our website reflects our company and mission much better than we expected. Thanks for a great experience!" SUCCESSFUL COMMUNICATIONS, IN PRINT, INTERACTIVE AND ON THE WEB. & Igor Pilichev. All Rights Reserved. Artisan Productions & Design - Sacramento Web Design Company. Offering professional graphic design services, Website maintenance, Stationary and Business Card Design. No portion of this site, including this web page, any sub-pages or any of the content or graphics, may be copied, retransmitted, reposted, duplicated or otherwise used without the express written permission.